Next stop Tucson! I found a casino with free RV parking up to 7 days. I didn’t know how long I’d want to stay in a parking lot but I thought I’d give it a chance. It turned out to be better than my previous casino parking experiences primarily because there were very few semis using the lot. They tend to make a lot of noise and come and go in the middle of the night. The Desert Diamond Casino was between an airport and a train track so it wasn’t incredibly quiet but all in all it was a positive experience and I ended up staying 5 wonderfully free nights. 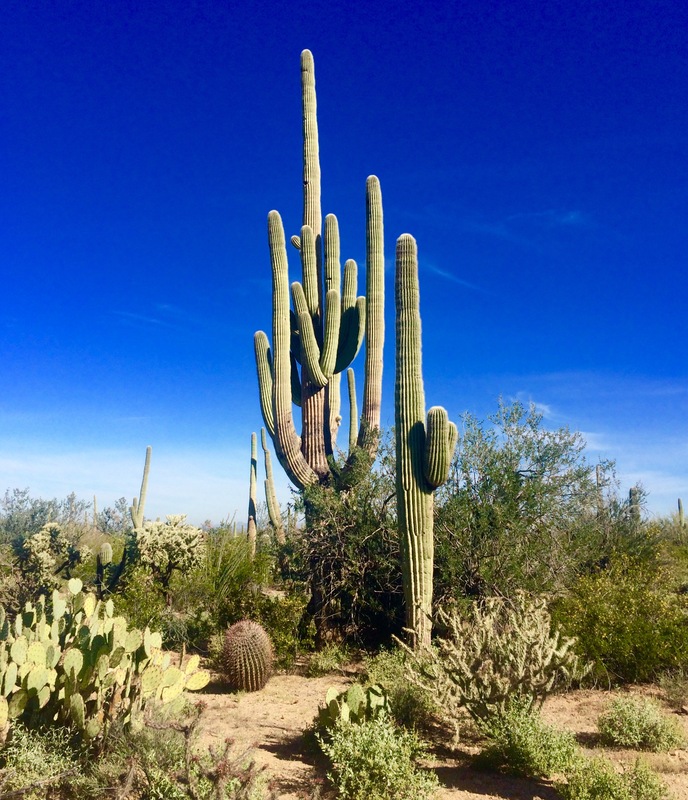 My primary destination in Tucson was the Saguaro National Park. Several people I had met since I started my travels had said it was not to be missed. It is divided in to two parks, one to the east of Tucson and one to the west. I visited the western side, called the Rincon Mountain District. I fully intended to make it to the eastern part later in the week but it never happened. It was getting pretty hot in the afternoons so I set out early one morning for my visit getting to the park at 8. The sight of so many huge saguaros was very impressive. But the best part of my visit was that it was clearly spring in the desert and so many cacti were blooming. I took a trail that started at the sight of some petroglyphs. There were quite a few rocks with interesting designs on them but you get the idea. I estimated the trail to be about 3 miles based on the tiny numbers I could almost read on the trail map. It also appeared to be pretty level except for the initial climb to the petroglyphs. That was exactly what I was looking for and would get me back to the trailhead before it got too hot. It was a great hike and I would not have missed it. The many sizes and shapes of cacti were amazing and the desert blooms were gorgeous. However, it did end up being over 4 miles and the last mile was in a sandy dry wash that was difficult to walk in. I was very hot and tired by the time I got back and my feet not the least bit happy with me. I switched gears from nature to asphalt the next day and headed to the downtown historic district of Tucson. I parked near the Fox Theatre. There wasn’t much to see of it but a neat old marquee. Then I walked to the oldest hotel in town that is still standing, The Congress. I was surprised to find that it was still operating as a hotel. Much of the lobby appeared to be original. I also walked a long way down 4th Street. This was lined with funky restaurants, vintage clothing stores, and cool bars. It is supposed to be a very happening place on the weekends but it was interesting to visit even on a weekday morning. It was also nice to get in a few miles walking on city streets without getting sand and rocks in my shoes. One thing I was determined to do now that it was hitting 90 every day was go swimming. I had hoped the casino might let me use their pool as some I had visited in the past had. But that was not the case. I looked for other options. All the rivers in the area were dried up. I discovered that Tucson has several public pools that they operate year round so I headed to one after lunch one weekday afternoon. That was the best $2 ever spent. There were more lifeguards than patrons while I was there. Of course, I did miss the chaise lounge chairs and waitresses bringing me drinks but the swimming was great! And my feet appreciated the break from hiking.